I was absent for this activity. At first when we landed unfortunately we crushed someone going to the bank to trade in a big sack of gold for cash. We took the gold and we bought all of our supplies. We bought some Conestoga Wagons but it was the wrong decision because they would get stuck in the mud. We tried to sell it to people but they would not agree. Then we sold them to the Prairie Schooner shop and bought three Prairie Schooners. We started out on the Oregon Trail. We got Blisters right before we got to the Kansas River. we decided to pop them with a clean needle and then put a gauze pad over the popped blister. Video explaining what I learned. 1. What type of person is Millo? 2. Do you think Millo is a good student? Why or Why not?Why do you think Millo acts the way he does? Would Millo be someone you would like to be friends with? Why or Why not? Describe a time time that you felt grumpy and disinterested like Millo. At the beginning of the solar system I crashed to the planet known as Earth. I was on the surface as snow and I eventually melted. I was having a lovely time in the nice quiet stream just flowing along. Then I got evaporated up into the sky, I was very lonely but finally enough molecules came up and we started to have a party. We started to condense into a cloud. Then we kept getting more and more molecules and I was starting to know a lot of people. One molecule started talking to me and told me about his first time. Then we got to many people and suddenly I was falling to the ground. I was so high up and I was about to puke! I was coming down as precipitation as rain. I was so scared then I saw a thing down below me. I realized that my friend was right next to me and I asked him what it is. He replied back oh its a dinosaur. “A what?” I replied back. “A dinosaur,” he told me. Then he told me that we are not going to be landing on it. then we landed and we were in a nice little stream. We had gotten accumulated into the nice little stream that we were in Then suddenly we were in a rough section with lots of rocks. We came to the edge of a waterfall and saw an amazing sight. We saw the amazon rain forest and lots of trees and a great big jungle in front of us. Suddenly we were going down the waterfall and we were going super fast. Then we ended in the lake and we got drank by a dinosaur and sweated out. I think that the water will bounce up and go down the rocks. I think that the water will be absorbed into the dirt. I think that the water will flow down the curved edges of the stick. I think the water will bounce up in a splash and come back down. I think the water will bounce off the grass and settle in the bottom of the cup. It bounced to the side and then went to the bottom of the cup. It got absorbed into the dirt. The water created ripples in the water that went all around. It bounced off until it got to the bottom. I was surprised that the water was bouncing to the side rather than up. I was surprised that the dirt did not go to the bottom. I was surprised that it actually at the bottom of the cup. I was surprised that the water did not go straight up but down and to the side with ripples. I was surprised that it actually got to the bottom and not just got stuck. 1. The material that surprised me the most was water on water because it did not make a big splash. 2. I still wonder about water on glass because I wonder if it will stay still or no. It really helped me prepare to speak in front of everybody. It also helped me compare the video. It helped me know what I was going to say and be comfortable with talking. It also prepared me for talking in front of crowds. I can compare my first video to my second video. It also helps me see the differences and similarity. I had practiced it about one hundred times before. I had also gotten comfortable talking. I really know what I was talking about so I did not use note cards. It was really cool to not use them. I was very comfortable talking about my project. I had modified it so it was shorter but with the same things. It helped me talk in front of big crowds. Also it helped me learn how to show pride in my work. I made some mistakes like presenting my poster. also I made some mistakes about explaining things. I would have explained my project better. It would have really been better if I did a longer presentation that was more interesting. Did your student leave our room felling good about them self? How do you know? What will you do differently when we meet Mrs. Acre's class? It was very fun to do this, first we introduced our selves and got some pillows. Then I played the game that's me, that's not me. It took me a little while to get my partner to talk about more advanced things like things that have happened to him in his family life. then we started to draw silly drawings about things in our imagination. I think that they did leave the room feeling better about them self. I know this because when he came in he was really nervous and he left really happy. I will try to talk more about the that's me that's not me and try not to focus on just doing a lot of things on that's me that's not me. Geologists use water for many things, they use it to study the earth, wash off rocks, and much more. When a Geologist looks at the earth and see a system of rocks that hold and transport the water and connects it to rivers, these are natural path ways that transport the water. Geologists study the natural solid and liquid resources on the earth. 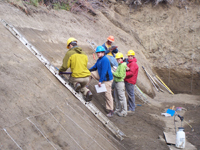 Hydrology is a form of geology that is about the water on earth.